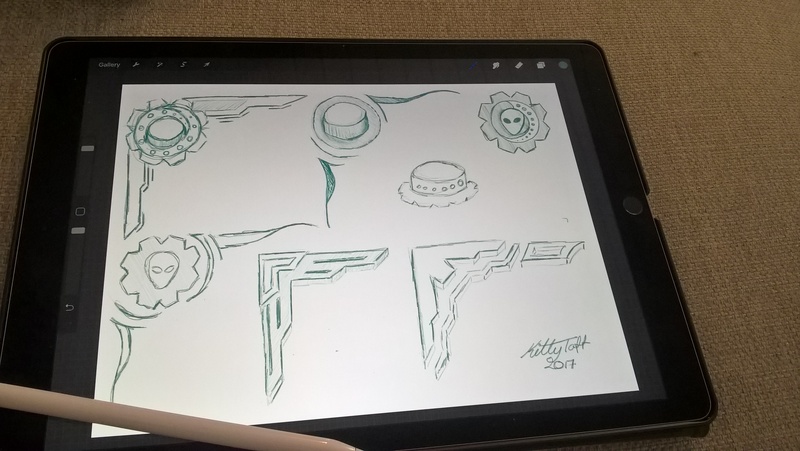 I love to draw on my new Ipad Pro, but I need to work on how and where I am drawing, my shoulder joint is having some issues because I am charging my joint. One of the things I have done wrong is sit in the car and Livingroom couch and draw. This makes my joint get more pressure where and not enough stability. I been working on that, and now see that I need to draw at a table, and have my elbow firmly on the table. This have worked much better. I been working on the game HUD, and I got some nice sketches. Got some good feedback on the one top left. I like that to, but feel I should manage to maybe add the logo inside it, that I believe would look cool.